Miro Dental Center is unique. Wondering what makes it so different? 1. Miro Dental Center treats patients of all ages and all stages of oral health. Miro Dental Center is not only one of the leading dental practices in Florida, but it is also a family dentistry that treats patients at all stages of oral health and all ages, from age 4 – 104. We treat patients who have baby teeth, children transitioning to adult teeth, teens and adults, and aging adults who may require specialized restorations. 2. We provide each type of oral care in one place. In addition to the outstanding dentists and professional staff, Miro Dental Center provides everything — general dentistry, cosmetic dentistry, restorative dentistry, periodontal treatment, endodontics, and orthodontics – in one location! We provide procedures ranging from sealants to crowns and conscious sedation dentistry to TMJ treatment, and everything in between. 3. We treat all members of the family. Rather than having children go to one dentist and parents to another, the entire family can go to a single, family dentistry, allowing our dentists and hygienists to understand family history and anticipate potential oral health problems before they develop. We also make it easy and convenient so that multiple family members can schedule appointments at the same time. Call us at 305-442-7444 today to learn more. 4. Our staff is compassionate and understanding. Miro Dental Center treats each family member with compassion and integrity, ensuring that each family member receives personalized treatment and the opportunity to discuss all treatment options. 5. We make decisions with you – not for you. At Miro Dental Center, we carefully and thoroughly examine each patient’s oral history and current dental health to recommend the best treatment options. We then discuss the treatment options with you, and together we make the optimal decision for your dental health and overall well-being. 6. We use the latest technology. Our goal is to provide our patients with optimal oral health by using state-of-the-art technology. With the dental field rapidly advancing, we are always looking for new and innovative treatments to create excellent, long-lasting results. 7. Miro Dental Center helps you look and feel your best! A new smile from cosmetic or restorative dentistry can create fresh confidence, producing a new world of opportunities for you both professionally and socially. Our dental treatments result not only in a beautiful smile, but also improved oral health, dental function, and teeth alignment. More advanced cosmetic dental services may include smile makeovers, dental implants to replace missing teeth or restore gum tissue, gum recontouring, dental bonding, and restorative dentistry to bring your teeth back to the healthiest they can be. 8. We provide advanced orthodontic treatment. We also provide complete orthodontic treatment to properly align your teeth and fix bit or jaw abnormalities. 9. We offer complete periodontal and endodontic treatment. If you are missing teeth or have had gum disease, we use the most progressive periodontal and endodontic technology to safely and effectively treat your gums and teeth. 10. 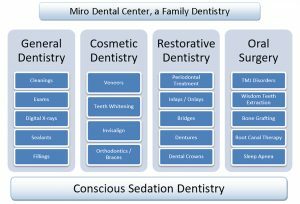 Miro Dental Center offers a comfortable, serene setting with sedation options to help you relax. We understand that many adults feel fear or anxiety about dental visits. So, we’ve created a comfortable, serene office where our highly skilled dental staff are conscientious and gentle with all our patients. We offer sedation dentistry that blocks pain and helps you completely relax throughout the dental procedure. Whether you have some fear, serious anxiety, or low-pain tolerance, our sedation dentistry will put you at ease. Dr. Claudio Miro and associates have been treating patients in the greater Miami area for over 30 years. As a team, we believe that the patient is of upmost importance at every level. We take pride in the care we provide to our patients at Miro Dental Centers. We take the time to make sure our patients are fully informed and are given all treatment options. Our goal is to the provide our patients with optimal oral health by using state of the art technology.